Born in 1955, Bill Gates is one of the most famous entrepreneurs in the world. Born in Seattle, he enrolled at Harvard College in 1973 but dropped out two years later when, together with Paul Allen, whom he met in preparatory school, they co-founded what was to become one of the largest companies in the world, Microsoft. Now, more than 40 years later, Bill Gates is constantly ranked among the richest men in the world and his company and its products are present in the lives of tens of millions of people. You can read more about him on Wikipedia. Besides his business ventures and philanthropic activity, Bill Gates is also known as an avid reader. His passion for reading is so big that a few years ago he started a blog, GatesNotes.com, where, even though he writes on several topics, the main focus is books. 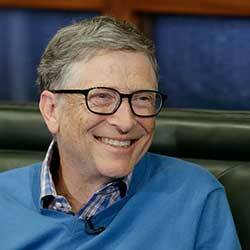 Business books, fiction books and everything else Bill Gates reads and considers is good enough to share. Besides his blog, he also mentions books quite often on his interviews or media appearances and has stated many times that he considers reading one of the things that contributed to his success.